Goldschläger is an Italian cinnamon schnapps (43.5% alcohol by volume or 87 proof; originally it was 53.5% alcohol or 107 proof), a clear liqueur with very thin, yet visible flakes of gold leaf floating in it. The actual amount of gold is extremely small and serves as a sort of novelty: there is currently less than a tenth of a gram (0.1 g) of gold flakes in a 750 ml bottle of Goldschläger, which, as of January 19, 2010, amounts to about 3.01 USD on the international gold market. 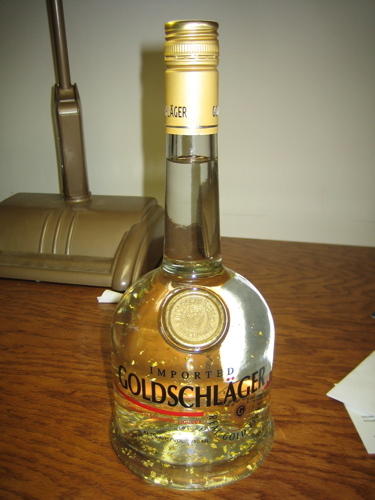 Left: A bottle of Goldschläger. Despite having Swiss origins, Goldschläger is a product of Italy and the brand is owned by Diageo. The German word Goldschläger ("gold beater") designates the profession of gold leaf makers, who beat bars of gold into micrometer-thin sheets.